Clinic Synopsis: In this newly developed clinic world-renowned tubaist, Sam Pilafian outlines a system for recruitment, training, and retention of low brass players. The clinic has three primary sections; techniques/tools to recruit low brass players, a three-pronged training system to develop low brass players, and a series of methods, ensembles, and activities designed to peak and retain interest in low brass playing. 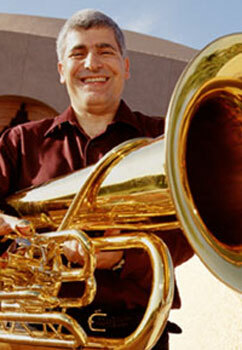 Clinician Biographical Information Sam Pilafian teaches tuba at the University of Miami Frost School of Music. He is perhaps best known as a founding member of the internationally renowned Empire Brass Quintet and also performs with the Summit Brass. Versatile in both classical and jazz realms, he has recorded and performed with several major orchestras and jazz groups. As a solo jazz artist, Pilafian has recorded fifteen CDs. He is an arranger, composer and recording producer and is the coauthor of the best-selling pedagogy texts “Breathing Gym” and “Brass Gym.” He was a faculty member at Arizona State University, and served 20 years on the faculties of Boston University and their summer Tanglewood Institute. As past president and chairman of the board of the International Tuba Euphonium Association, Pilafian now serves on its board of directors.